LUDLOW, Mass. – It takes him less than a minute to lift them off their seats. On a seasonably warm evening in a stadium neatly tucked inside a neighborhood packed with ranches and capes, the Western Mass Pioneers and CFC Azul are only moments into a Friday night match in front of about a thousand supporters, many of whom are just settling into their seats before a bolt of energy flashes before them. Forty seconds after the opening whistle, a Pioneers midfielder takes it up the right, then swerves inside with a teammate ahead, who suddenly darts on a diagonal run toward the corner flag. The ball jumps ahead of the player, who’s wearing the inconspicuous number 25 shirt, and straddles it with his right foot inches before the end line. An Azul defender breaks sharply to get in front, but can’t recover in time. Number 25 ushers it along the line, and with nearly no angle to work with, decides to try his luck and hits a low, skipping shot toward the far post. It veers wide by less than a foot. Despite the early breach, the Azul back four should feel fortunate. Alencar Junior rarely lets a defense off the hook with only a warning. It’s a strength he’s used well enough to collect 19 goals in his last 17 PDL games. 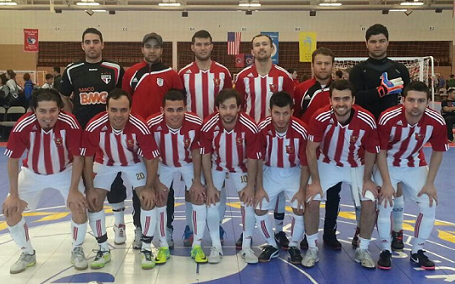 Junior (top row, third from left) regularly plays with Safira FC, a futsal team based in central Massachusetts. Junior – whose full name is Alencar Ventura, Jr. – is not your typical player in the Premier Development League (PDL), which sits in the fourth division inside the American soccer pyramid. Nor did the 27-year-old forward arrive in a league brimming with college prospects in the most conventional way. He grew up in Ji-Parana, Brazil idolizing Ronaldo, and often imitated the flashy forward’s moves whenever he had the ball at his feet. And not just on the pitch. Like so many Brazilian soccer players, Junior also played futsal, and competed professionally in a local league that won a host of trophies. When he wasn’t gliding across futsal courts, Junior was playing third division soccer for Ji-Parana, which entered into the Copa de Brazil while he was on the team. By his early-20s, it seemed as if he had everything he needed. But deep down inside, Junior felt there was something more for him out there. There had to be more. He put he’d everything he’d ever known and achieved in the rearview. The trophies, the packed futsal arenas, the clashes with top division sides in the Copa de Brazil tournament were all cast aside. It was time to embark on a new journey. He arrived in States in November 2007, and immediately sought out a place to continue his career. Naturally, Rogerio, who was playing for Bay State Soccer League (BSSL) outfit Boston Olympiakos, was already one step ahead. Junior continued to play in local amateur leagues before he caught the eye of Phong Le, a Worcester-based businessman who was in the process of launching a new PDL team – the Worcester Hydra. And so the 6-0 striker signed on to play with the Hydra, where he went on to score 10 goals in 11 games, and played alongside future MLS players Charlie Rugg (Los Angeles Galaxy) and Michael Bustamante (New York Red Bulls). 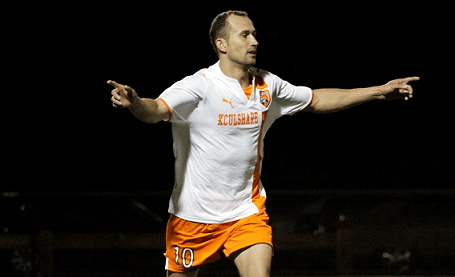 He was named to the All-Conference PDL Team for the Eastern Conference. It wasn’t top-flight, or even third division, at that. It didn’t matter. Junior was doing what he did best: Taking on defenders, then beating them handily, like a chess master looking across the board at a casual player. But shortly after the season came to an end, the Hydra folded, and Junior was suddenly without a team. In the months that followed his sterling season with the Hydra, Junior returned to BSSL and starred with Mass United, and became a major part of their U.S. Open Cup and Amateur Cup qualifying efforts in the autumn. Once again, he made it look easy, scoring goals against back fours that didn’t have the pace, savvy or skill to keep a player of his ability away from the 18. But once spring came around, it was time to find a new PDL team. With nothing left of the Hydra but an outdated website, Junior believed he might have to bide his time BSSL again. That was until an opposing PDL coach gave him a call. He was excited to get another opportunity in PDL. And that’s exactly how he viewed it: As an opportunity. He didn’t arrive in Ludlow to be a star or to have the thousands who come out to the famed Lusitano Stadium to bow before him. He just wanted to play, and this was another chance for him to do what he does best: Go to goal, and score. But there was one slight issue. Junior, who works 10-hour days for a Foxborough-based construction company, couldn’t always make the trip from Boston to Ludlow. Not because of a demanding 10-hour work day, mind you. No, it wasn’t that. It was because he didn’t own a car. Undeterred, Molinari and the Pioneers wouldn’t let that get in the way of having Junior on the roster. Now, it would be easy – and completely understandable – for someone to work 10 hours, then take a two-hour ride to the stadium and clock in a cameo appearance. Maybe come off the bench, score a goal, then wave to the fans at the final whistle. But even after a full day’s work that often starts at 6:00am, Junior regularly plays 90 minutes, and rarely shows any of the effects that 10 hours of physical labor can have on any player, regardless of skill level. Give up? Junior’s done anything but that. Since his Pioneers debut on Jun. 14, Junior has played six games. He’s scored nine goals, including a hat trick he registered against the Real Boston Rams on Jun. 19. But goalscoring isn’t the only thing that’s made him an instant success in Ludlow. His personality has made him a fan favorite, too. After each Pioneers home game, children are encouraged to wander onto the field to say hello to the players and coaches. Often, they circle around Junior, who happily obliges every request for an autograph, photo, or even a high-five. On the same night that Junior’s first minute foray in the Azul area lifts the Pioneer partisans off the aluminum bleachers, he predictably finds the back of the net in the 44th minute. On a Ronaldo Vieira corner kick, he slithers through at least three defenders before reaching the near post, where he delicately deflects it through with his right foot. The crowd loudly cheers the strike, of course, but there’s something different about the way the Lusitano faithful applaud this goal in particular. There’s a palpable sense of awe in their applause. The manner in which Junior’s attacks the near post, then flicks it through is something else. In fourth division soccer, the goals aren’t always smooth or artfully crafted. The one that Junior scores is both. There’s no question Junior is in a class by himself at the PDL level. In fact, his track record suggests that he might be better suited for a higher level of competition. He says he was offered a tryout by the Rochester Rhinos – a third division side in USL-PRO – last year, and was initially open to the idea. But after learning the terms of a standard USL-PRO deal, he realized he wouldn’t be able to make it work financially. So what does the future hold for the Brazilian forward? For starters, he and his wife Susanna are expecting their first child, a boy, who is expected to be born this week. And when he talks about his son, whom he’s already christened “Leandro,” a smile stretches wide across his face. He’s happy to chat about soccer, futsal and goalscoring, but his face radiates with excitement when he thinks about his son. As far as soccer goes, Junior is looking forward to taking a few weeks off to spend with his wife and new son. He’ll compete in a futsal tournament with Safira, and it’ll remind him of his days in Brazil, no doubt. After that, he’ll return to playing outdoors in Boston, as well as Rhode Island, where he’s also found a home with Pawtucket-based side Italia 90. Next year, he’d like to return to Ludlow, and play another season with the Pioneers, which feature one of the most supportive home crowds in PDL. Without question, he’s enjoyed his time in the small, soccer-crazed town, where he’s become somewhat of a local celebrity. But he also has his sights set on a bigger target – perhaps the biggest target the speedy striker has ever set his sights on. Thanks for writing about this guy. I hope the Revs can bring him in to training and see how he fits in. I’m sure you will let us know if this happens! Absolutely, Mat! Thanks for reading! What a great story. I’d buy his Revs jersey! Great story I’ve seen this guy and his team play fustal many times at the regional and national level great player. I also recently went to see a Rhode Island Fc game in Cranston their goalkeeper is absolutely fun to watch. He looks very young and i think hes not evening pushing 5’8 but plays like he7’0 tall I would like to absolutely follow both these guys careers.